The Best Music Marketing Blogs from thousands of Music Marketing blogs in our index using search and social metrics. We’ve carefully selected these websites because they are actively working to educate, inspire, and empower their readers with frequent updates and high-quality information. Also check out Music Marketing Youtube Channels. Music Marketing newsletter is a comprehensive summary of the day's most important blog posts and news articles from the best Music Marketing websites on the web, and delivered to your email inbox each morning. To subscribe, simply provide us with your email address. Portland, OR About Blog CD Baby is more than just a music distributor. We’re a community of like-minded artists looking to buck the major-label model, and support independent artists in every way we can. Discover everything you need to know about music promotion on your own terms. Explore hundreds of articles about moving your music career forward. Facebook fans 165,049. Twitter followers 84,579. About Blog Bandzoogle is the most effective platform for musicians to build their website and manage their direct-to-fan marketing and sales. Bandzoogle makes it easy for musicians to build a great band website. Get Advice, inspiration & resources for bands and musicians navigating the music industry. Learn how to successfuly promote your music and make money as an artist. Facebook fans 52,489. Twitter followers 16,315. Pennsauken, NJ About Blog Despite our success (or because of it), we continue to be firmly focused on our mission: helping independents – whether musicians, filmmakers, or small businesses – compete head to head with companies much larger than themselves. Become a successful independent musician! Pro tips & advice for audio recording, mastering, music marketing and promotion, songwriting, music licensing and more. Facebook fans 121,879. Twitter followers 35,881. About Blog Music Think Tank is a leading music industry and artist advice blog, managed by Hypebot.com. A group blog bringing together key thinkers in the realm of online music business. Facebook fans 3,309. Twitter followers 32,851. About Blog Music Consultant is a company that strives to help foster, develop, and guide the careers of both established and developing artists. Working with a long-term vision of creating enduring careers for these artists, we offer customized, strategic marketing and management services for every individual artist. We help artists navigate the music business and formulate music marketing strategies. Facebook fans 2,853. Twitter followers 29,148. Facebook fans 270. Twitter followers 192. Brooklyn, New York About Blog TuneCore believes all artists, from emerging to established, should have affordable and equal access to all channels of music distribution. At TuneCore, we like to keep things simple and transparent. We are all about getting your music heard and bought so you can get paid; we want you to make a living doing what you love. Facebook fans 230,536. Twitter followers 118,541. Miami & NY About Blog Welcome to our music marketing blog where we aim to help as many artists as possible! Learn more tips and tricks on how to take your music career to the next level. Music marketing and music tips all in one blog that will help build your brand in the music industry and drive attention to your new music. Facebook fans 6,444. Twitter followers 35,181. Boston, MA About Blog Sonicbids provides a suite of tools and resources that connect musicians with promoters, venue owners, and great music opportunities all over the world. Get Music career advice from industry experts and access to new gigs, licensing and other playing opportunities to grow your career. Facebook fans 165,105. Twitter followers 16,533. Raleigh, NC About Blog The CAB blog includes articles providing tricks of the trade and best practices for artists, as well as news, interviews, artist showcases and recommended products/services. Brooklyn, NY About Blog We help artists to build bigger and better fan communities around their music. Get the latest tips and tricks for your music marketing, digital promotion, and how to grow a bigger fan community. Facebook fans 55,469. Twitter followers 1,631. About Blog Music marketing is what this site is all about! If you don’t market your music, you won’t get very far in your music career. Read all of the below (or at least those guides relevant to you) and start properly marketing your music today. Huntington Beach, CA About Blog Brian Hazard is a recording artist with twenty years of experience promoting his ten Color Theory albums, and head mastering engineer and owner of Resonance Mastering in Huntington Beach, California. His Passive Promotion blog emphasizes “set it and forget it” methods of music promotion, along with a few tips on mixing. Facebook fans 16,675. Twitter followers 2,572,538. California About Blog Music Marketing Manifesto has been helping independent artists successfully promote and market their music since 2009. Music Marketing Manifesto is a leading resource for today's DIY musicians and Music Business Professionals. Sacramento, CA About Blog D4 Music Marketing is an online marketing resource for DIY musicians who want to maximize their ability to make a living off music and change the lives of people along the way. The aim of this blog is to help you stay on top of the best practices, insights and strategies to increase music exposure and attract life-long fans. Facebook fans 100. Twitter followers 145. USA/UK/EU About Blog Music Promotion, Inc. provides marketing, consulting & strategic planning services for artists, bands & recording labels. Need a marketing plan? Want to service your song to film/television Music Supervisors? Need help defining your goals, set up a team or insure you are on the right track? This is what MPI does. The founder, Amanda Alexandrakis, has been working in music marketing for 18 years and works with a variety of genres & teams from regional projects to worldwide releases..
Facebook fans 2,117. Twitter followers 1,889. Facebook fans 4,511. Twitter followers 2,506. Brentwood, TN About Blog Hi, I’m Keith Stancil. I am President/CEO of Artist Garden Entertainment and I have been blogging here since 2009. My passion is to share thoughts on current industry issues, share great new music and to encourage and equip independent artists and labels with marketing ideas. Facebook fans 60. Twitter followers 19,770. Los Angeles, CA About Blog Our sole focus at JamMob is to help independent artists connect with fans and turn their passion for music into a successful career. We update the site regularly with additional resources and training to help you promote your music, get more exposure, and grow your fanbase. Facebook fans 1,479. Twitter followers 3,219. Seattle, WA About Blog We are the Noise Complaints Group, We empower creatives and artists in the digital age by providing consulting services and educational products. Our services help artists move from being indistinguishable in a crowded market, to a recognized brand, with opportunities to earn revenue and freely do more of what they do best, create. Facebook fans 244. Twitter followers 68. 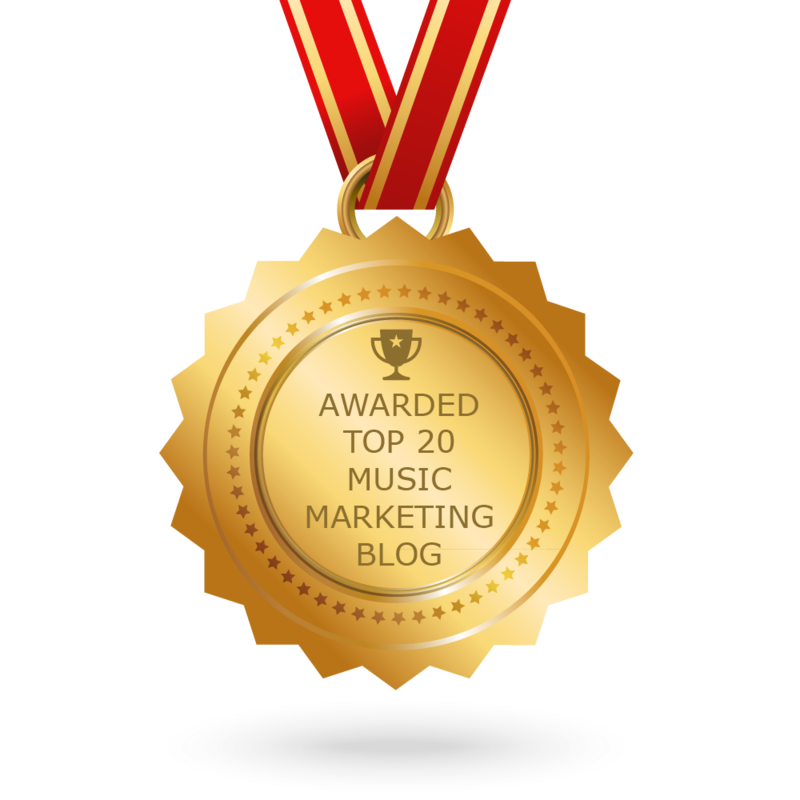 CONGRATULATIONS to every blogger that has made this Top Music Marketing Blogs list! This is the most comprehensive list of best Music Marketing blogs on the internet and I’m honoured to have you as part of this! I personally give you a high-five and want to thank you for your contribution to this world.